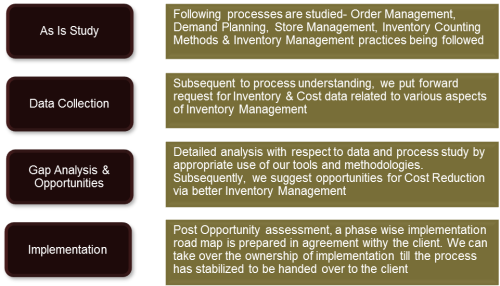 Inventory Management, of late, has been a core area for operations excellence for manufacturing and supply chain driven organizations. It assumes critical significance for FMCG products as well as other commoditized goods where when poor inventory management may lead to product stock-out causing lost-sales and, more importantly, a lost customer. Similarly, excessive inventory at hand would mean capital locking and consequent interest costs, possible product expiry, additional storage expenses, and so on. At Beacon, we understand the importance of inventory management for your organization. Our three-fold inventory management approach is designed to look at your inventory requirements at various points comprehensively. This is followed by an inventory decoupling approach to ensure that every material transfer point has optimal inventory level based on point-specific service level requirements. A key component of our inventory management approach is elimination of DEPS (Damage, Expiry, Pilferage, and Stock-out). We also assist organizations in deploying a comprehensive warehouse management system (WMS) and ensure that the WMS is integrated to the inventory management tools recommended and deployed by us. Overall, through our comprehensive and integrate inventory and warehouse management approach, we help clients achieve manufacturing and sales flexibility, reduce working capital, and eliminate material loss while meeting desired service levels for internal and external customers.